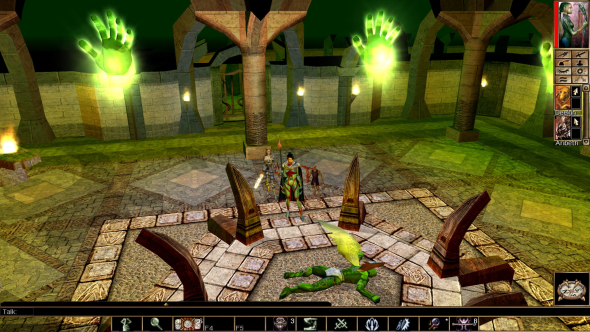 Beamdog, the studio responsible for enhanced editions of ye olde belov’d Infinity Engine games like Baldur’s Gate and Planescape Torment, will be sending out keys for a Steam beta of Neverwinter Nights: Enhanced Edition this week. Here’s our list of the best classic PC games still worth playing today. Company CEO Trent Oster and studio director Phillip Daigle made the announcement during a livestream Friday, which also covered developments on other Beamdog projects such as localization for several already-released titles. The big news, however, was Neverwinter Nights: Enhanced Edition. In addition to the upcoming Steam beta, which will run alongside the “head start” edition that preorder customers are already playing, they also unveiled a new character model for Lady Aribeth de Tylmarande. The studio is creating all new models for all the characters in the game, but they’ll be optional and available through the Steam Workshop. That way, players who prefer the game’s original look won’t have to use the new assets. Invitations to the beta are limited, and to request one you’ll have to go through Beamdog’s official Discord server. More details are available over at the Beamblog.